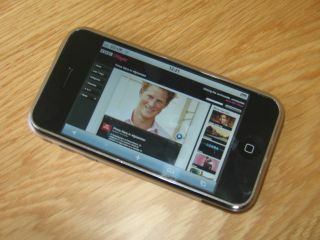 Hands on with the BBC iPlayer - on the iPhone! We knew this day would come, but didn’t quite expect it so soon. The BBC iPlayer is now available as a beta for the iPhone and iPod touch. Streaming only, mind. And we’ve had a play, so read on for our verdict. It has to be coincidence that the announcement came a day after the SDK was released, but it might not have been, had the iPhone got Adobe’s Flash player as part of the announcement. But that never came and Steve Jobs doesn't really seem that bothered. So the Beeb is to spend time encoding special 516Kbps streams for the iPhone and iPod touch. And quality is the main reason for that. The flash content isn’t amazing in quality for the PC, but would look pretty decent on the iPhone. However, the new streams look even better. “We're not using the new Apple SDK, nor are we using the much-rumoured Flash for iPhone (no - we haven't seen it, either). Instead, we're creating 516Kbps streams (400Kbps H.264 video, 116Kbps AAC audio) that show off BBC programmes brilliantly on an iPhone,” says Anthony Rose, head of Digital Media Technologies at the BBC in a blog post about the launch. So what’s it like to use? Well firstly, you’ll need a Wi-Fi connection. It won’t work over anything else. You simply access the BBC iPlayer site in the same way as you would on a computer – there is no special iPhone version and it’s all based around the iPhone’s Safari browser. Click the programme you want as usual. Then, instead of the Flash-based ‘click-to-play’ button over the programme picture, there’s a QuickTime play button. Click that, then the programme will load in full screen in 5-10 seconds. It has to be said that quality is excellent, both visually and surprisingly in terms of sound. Playing iPod tracks out of the iPhone’s tiny speaker invites a storm of distortion, but little of this is present when watching a TV programme. If you exit the programme at any stage to check your mail or make a call, the vid will resume at the same place – very handy. If a call comes in, you can start the video at the same place by clicking play after the call has ended. We’ll tell you what though – don’t play any video when you need to make an important call afterwards and you haven’t got your battery charger. It ate our iPhone’s battery quicker than you can say ‘factory replacement only’. However, one problem with the decidedly beta release of the iPlayer for iPhone is the lack of programming available in the new encoding. That’s something which will obviously change. Support for other mobile devices will also descend, but the Beeb has gone for the iPhone headlines first – oh, and the high quality video. Rose also posts about the logistics of getting programmes onto iPlayer, encoded in streaming and downloadable formats – it’s really very interesting reading. Over 50 rack-mounted dual quad-core Xenon-powered PCs are used for the transcoding of up to 24 programmes at a time, for example. With the launch of iPlayer for iPhone, the BBC has certainly shown that it’s willing to create new encodings of iPlayer content for other browser-based devices. And that’s good news for manufacturers and owners of other handheld devices, too.